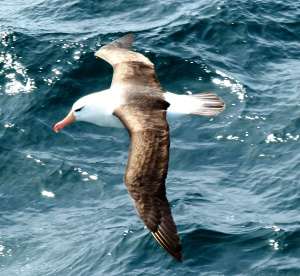 The day of the Albatrosses – a day of wonder. A wonderful day that will stick in my memory for ever. 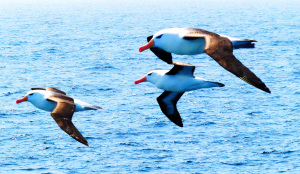 The wondrous day of the albatrosses was a day to remember for ever. As we travelled north and the days cooled the wild-life changed. We lost the boobies but we gained Giant Petrels. With their seven foot wingspan they were impressive birds but I wanted to see the fabled albatross. The desire was like a weight around my neck. I ached to get a single good photo of a real albatross. They were like fabled beasts. We saw a number of them in the distance, gliding on the wind and then a few settled on the water looking like overgrown gulls, but never one close up. I was beginning to think it would never happen. But then the most incredible event occurred. Indeed a moment for you to treasure for always. Dewin – they are indeed wonderful, as is all nature. To see them hanging in the air so close, all around, for no fathomable reason, was magical. Nobody knew what that was all about. They just wanted to visit. What a day. In deed a magical moment to always remember. Who knows why these great aeronauts do what they do and visited you other to simply share their being with yours. The Albatross is a legendary bird with quite unique symbolic attributes – its idealised status immortalised in Samuel Taylor Coleridge’s epic poem – The Rhyme of the Ancient Mariner (published in 1798) – which largely foreground qualities such as: freedom, exploration, adventure, pursuit of new paths/directions, harmonious living, faithfulness in heart and soul, symbiotic living with Nature, conservation of energy, independent thought without co-dependency, physical and emotional endurance, and navigation of and through life. No doubt the list is not conclusive. 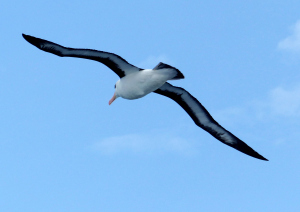 I’ve never seen an Albatross but the way you describe the sense of them just hanging their makes me think of watching Jumbo Jets coming into land, seemingly hanging there as if by an invisible thread, neither appearing to rise of fall of moving hardly at all. One day I hope to be as fortunate as you and watch nature’s finest do what only we can attempt to emulate. Enjoy your day good friend. Loaf and prosper. Dewin – those birds are huge and magnificent. To watch them effortlessly sitting on the wind is so amazing. They defy gravity. Oh to be able to glide through life so gracefully. Today I write, I solve some financial problems (hopefully) and meet up with friends. I hope your day goes well. I’m sure you’re doing that graceful gliding yourself Dewin! All the best.